A Gofund me account to help clear Kanye's $53million debt has been set up and has so far raised under 300 dollars. 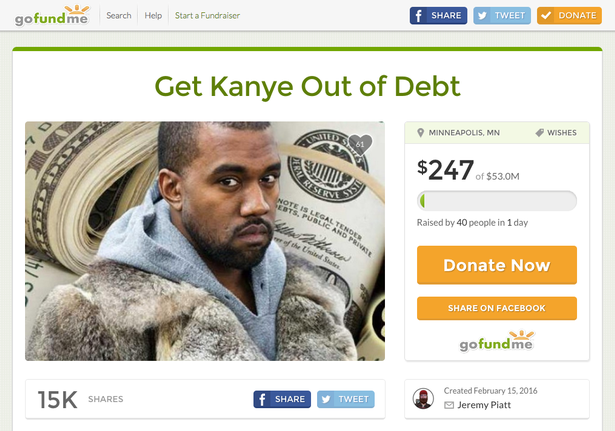 We must open our hearts and wallets for Kanye today,"Sure he is personally rich and can buy furs and houses for his family, but without our help, the true genius of Kanye West can't be realized.Kanye West has told us time and time again that he is the 'greatest living artist and greatest artist of all time"Great artists need to be supported financially to achieve their full potential. "I am Warhol. I am the number one most impactful artist of our generation. I am Shakespeare in the flesh. Walt Disney. Nike. Google. "Now who's gonna be the Medici family and stand up and let me create more?